Facebook is the ultimate social media website that connects friends and families across the world. People use PC, Tablets, Smartphones etc to access Facebook. And in this maniac social media world Android has rooted its strength in the market. There is an app almost for everything. By default Android Facebook app on doesn’t allow saving or downloading images from the album on the Facebook. The only option to download Facebook images is to download using a browser of third party. The reason is simple because the option to download images is not available in Facebook app. But in this evolving generation, some developer has done a good job of creating this app so called Facebook Photo Downloader. 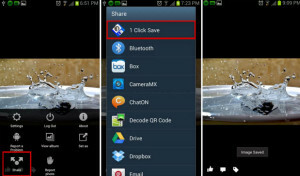 Facebook Photo Downloader App for Android enables your Smartphone to save and download images in one click. After installing it doesn’t act like an app but acts like a plug in. 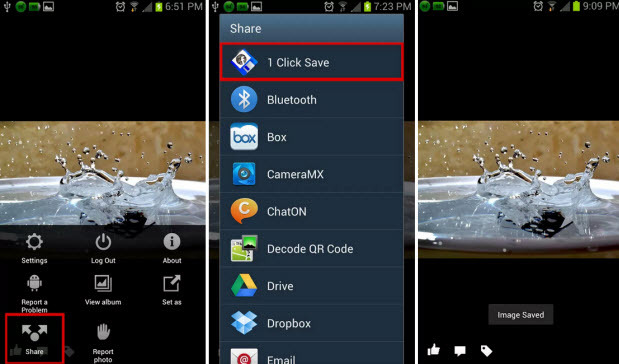 when you browse through Facebook images on your Smartphone app, click on the options to select share button. In the share option, you will see a plugin listed as ‘1 click save’. In some apps you want to migrate from the current window to a download page in order to download images. But while using this app to save photos from official Facebook android app, there is no need to navigate away from Facebook while saving. Some people take screenshots in order to save images from Facebook app. But this is not required now thanks to this amazing app. just click share and use 1 click save option to save the image directly on your device. There is one more similar app that allows you to save photos from official Facebook android app is from bunny labs Facebook photo downloader. It is very similar to the above app what I described. For this you have to use menu option in order to download the image and then select share and use ‘download photos from Facebook’ to download the images to your device or memory. It downloads pics like a bolt of lightning.